Get your Pack Brazil to enjoy the Brazil, 2 faces. Pay a ticket and get a 50% of discount on the purchase of the second show (only for the purchase of two diferent shows). Add the two inputs into your cart and the discount will be applied automatically. Onde o horizonte se move (Where the Horizon Moves) is a site-specific project where the horizon is treated as a field of shared fiction. Through the selection of a landscape and a place from where the audience can observe it, the project generates its gradual transformation through figures that appear and disappear on the horizon. This piece features neighbours from the Poble-sec district as volunteers and invites the public to witness a process of deceleration: from a vantage point, a plateau, an avenue, a landscape unfolds, a city is revealed. Here, the spectators, as if they were the guardians of the past, travel the horizon to decipher these figures blotted out by the sun, which become people, stories, worlds. Gustavo Ciríaco is a Brazilian artist based in Rio de Janeiro. He has a strong international presence and has presented his works in Europe, Latin America and the Middle East, and more recently in the Far East. His work combines various artistic disciplines, showing an interest in other knowledge, other fields, other voices; often through people, looking for other ways to cope with everyday life, adding potential, tools and knowledge about how to deal with time and space. He has used choreography, theatre, video, storytelling and urban actions in conversational works where the encounter is the inspiration for fictions and shared situations. Where the Horizon Moves was included in the official programme of Guimarães – European Capital of Culture 2012 (Sweet & Tender Collaborations, organized by Maus Hábitos) and by the Rio Occupation London artistic mission at the London Cultural Olympiads in 2012. 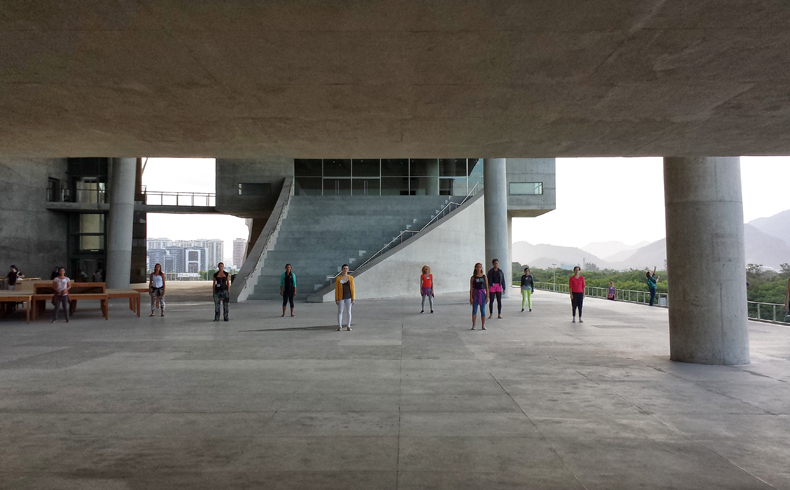 The project was in residence at the Cidade das Artes, programmed at the Panorama Festival (Rio, 2013) and toured with the SESC Arts Circuit, visiting nine cities within the state of São Paulo. This show will be in a public space. The meeting point will be the Mercat de les Flors’ Hall at 6pm (Saturday and Sunday morning, at 12pm) and will have to travel 15 minutes on foot. BRAZIL, 2 FACES. Actual brazilian creators.